Image caption One passenger said the derailed rear coach flipped over and over "like a tumble dryer"
The devastation caused when the last carriage of the 1245 from Kings Cross flew off the rails at Potters Bar in 2002 went far beyond the twisted metal and shattered concrete of the station. The families of the seven people killed on 10 May that year still live with the pain of losing their loved ones in the crash - and the two-month inquest into their deaths has been, as one relative put it, "like picking at an old scab". Yet, the impact of the accident may well have been far worse, had it not been for a number of ordinary people who did a number of extraordinary things that day. The inquest heard how fellow train passengers, waiting travellers, passers-by, rail workers, off-duty emergency employees and staff from nearby businesses all put their own fears aside and dashed to the aid of those affected by the derailment. Judge Michael Findlay Baker QC, sitting as a deputy coroner, made a point of highlighting these acts of kindness during the inquest, saying it was "gratifying" to recognise the remarkable response from local people and passengers. "I do so now publicly", he said. Among those to whom he was paying tribute was Wing Cdr Martin Rose, who was travelling inside the fourth carriage. He remembers being tossed around in the derailed rear coach, which, he said, flipped over and over "like a tumble dryer" before coming to a halt under the station canopy. But despite temporarily falling unconscious, the RAF pilot picked himself up off the carriage floor and checked for fire before going to the aid of an elderly couple who had been sharing the first class section with him. They turned out to be author and survivor Nina Bawden and her late husband Austen Kark. Wing Cdr Rose first made attempts to pull Mr Kark out from where he had become trapped, but when he realised the 75-year-old was not going to regain consciousness, he concentrated his efforts on keeping Ms Bawden, now 85, alive. "She was badly hurt, you know, quite a trauma. I thought: if she does drift into unconsciousness, she might never wake up again. So my efforts were then focused on keeping her talking, keeping her awake." By that time, waiting passengers from the station platforms had begun to come to people's aid. Off-duty police officer David Bedford jumped onto the tracks and smashed two of the fourth carriage's windows, using lumps of broken concrete, to help people escape. "I picked one of these up and it was quite heavy," he said. "I recall having to use both hands, and I threw it at the window, but it took two attempts before I managed to smash the first window." Pc Bedford went on to help casualties out of the carriage, staying at the scene for four hours - even offering his coat as a make-shift pillow. Computer worker Alun Ticehurst, based in a building overlooking Potters Bar station, was also helping the injured minutes after the crash. He had rushed to the scene after hearing a "loud rush" and "big bang" and seeing the train straddling the tracks. "We noticed there were casualties, so we immediately grabbed our first aid kit and went down to see what we could do," he said. "[They were] trying to help wherever they could, basically. It ranged from giving first aid - there were lots of first aid kits there that seemed to appear out of nowhere - trying to give what assistance they could," Mr Ticehurst said. Among them was Sally Hatton, hairdresser at Potters Bar's Sunshine Hairdressers, who had grabbed her kit as soon as she realised there had been a crash. On her way to the station, she tended to victim Agnes Quinlivan, 80, who had been fatally injured by falling debris under the railway bridge. "I started to speak to her and checked her airway but I did not move her," she said. "People started to join me and they wanted to move her, but I said 'no'. I just stayed with her, stroking her hair and hand." She then continued her journey to the station, checking on the welfare of a number of casualties, before comforting a man she remembers only as Dan. "He was quiet and had trouble in breathing. I reassured him by talking to him and tried to get him to breathe slowly and regularly," she said. She stayed with the injured man until she handed him over to paramedics. "I gave him a kiss and said goodbye," she said. So many others also helped that day, including a man who took a detour while "heading to the chippy" and staff at Sainsbury's, who turned their store into a make-shift hospital. 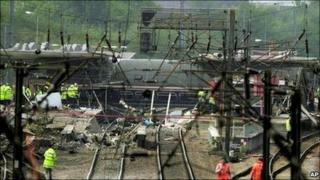 And then there were the rail workers - whose swift action is almost certain to have saved further loss of life. Driver Gordon Gibson, known as Andy, and signal inspector Roger Badger - both in the cab of the fated 1245 to Kings Lynn - used circuit clips to warn the signal office at Kings Cross and track detonators to alert other drivers. Mr Gibson also helped a seriously injured passenger out of the train with ladders. Michael Baker, platform supervisor at Potters Bar, warned incoming trains and ensured the live overhead cables were turned off. And Alan Williams, the driver of a train travelling towards Potters Bar from the north, managed to come to a halt before hitting the derailed carriage. He went on to help other trapped passengers escape. Yet, despite the extraordinary things people did in the aftermath of the crash, some of those that dashed to the aid of the injured have told of their difficulty in coming to terms with the devastation they saw. Some described a desperate need to keep busy, while others spoke of a kind of shame. Lecturer Louis Spring, another waiting passenger who sprang into action, perhaps summed up their feelings when he confessed to feeling "very ill-equipped" to deal with what happened. After hearing shouts for help from inside the derailed carriage, he had assisted in pulling people free and comforted many of those injured. But, eight years on while giving evidence to the inquest, he described a lingering "sense of guilt" about not being able to do more. "Let me be honest and say that all I could do - I am a minister - and all I could do was pray, and that is what I did."